Grilled Buffalo Wings are a summertime favorite at my house. 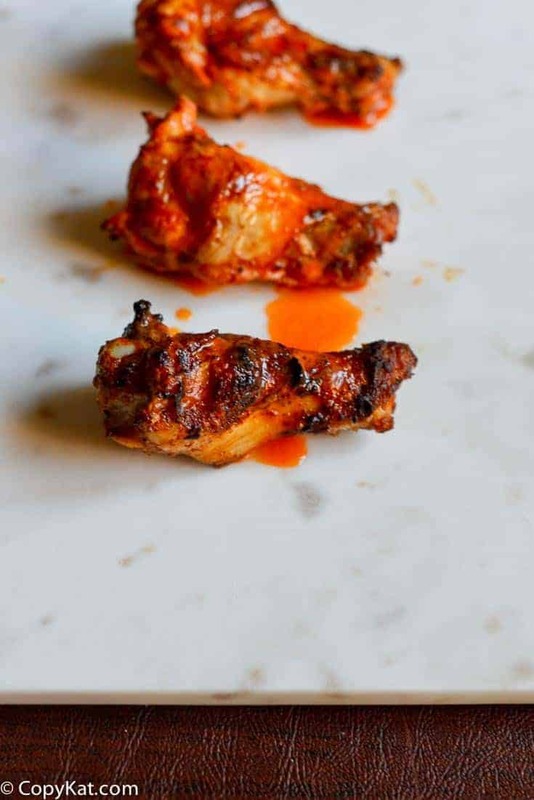 I love buffalo wings, and it is hard to beat them, but you can grill, this makes your recipe for buffalo wings simply outstanding. I make my hot wing sauce for this recipe. I love Frank’s Red Hot Sauce, to me, this has the best flavor. Many standard hot wing sauces are simply a mixture of butter and hot sauce, and I will admit this sauce tastes quite good. For my grilled wings, I like to add a little something more. To prepare this sauce, I like to add some fresh garlic and some fresh hot peppers to add some additional heat to this sauce. Wings are very easy to cook on the grill. I like to first marinate the wings in part of the hot sauce mixture, and then finish the wings with the remaining sauce just before serving. I like to oil the grill with a bit of vegetable oil. You can use any oil to form down the grate you don’t need to use olive oil, plain, inexpensive vegetable oil will work. These take 25 minutes on a medium-hot grill; you will need to flip these about halfway through their cooking time. When they are done, there may be some pieces with charred portions. When you serve this up, you may want to serve these up with a homemade blue cheese dressing and some celery sticks. Grilled Buffalo Wings are the perfect addition to your grill. In a small pot combine the hot sauce, garlic, jalapeno peppers, butter, and Worcestershire sauce over low heat. Allow the sauce to simmer for about 30 minutes. Stir to combine until the butter melts. Place chicken pieces in a large container, and pour 1 cup of the sauce into a container. Allow chicken to marinate for at least 30 minutes. Heat grill to approximately 375°F to 425°F. Pour about 1 tablespoon of vegetable oil on a paper towel. Run the grates with the oiled towel to lubricate the grill. Remove the wings from the marinade, allow the excess marinade to drip off, and discard the used marinade. Place the wings on the grate in a single layer so they’re not touching (if needed, cook them in batches). Cover the grill and cook, flipping the wings occasionally with tongs, until they’re no longer pink at the bone and the skin is slightly charred in spots, about 25 minutes total. When all of the chicken in done, place in a bowl and drizzle remaining sauce over the wings. Serve with blue cheese salad dressing if desired. I’m a huge wings fan, and these look delicious. Thanks for the recipe! Thank you! What are your favorite types of wings? Garlic Parmesan tossed with Texas Pete Buffalo Sauce. I am going to have to look for Texas Pete Buffalo Sauce. I love Frank’s Red Hot Sauce so much I never try anything else.